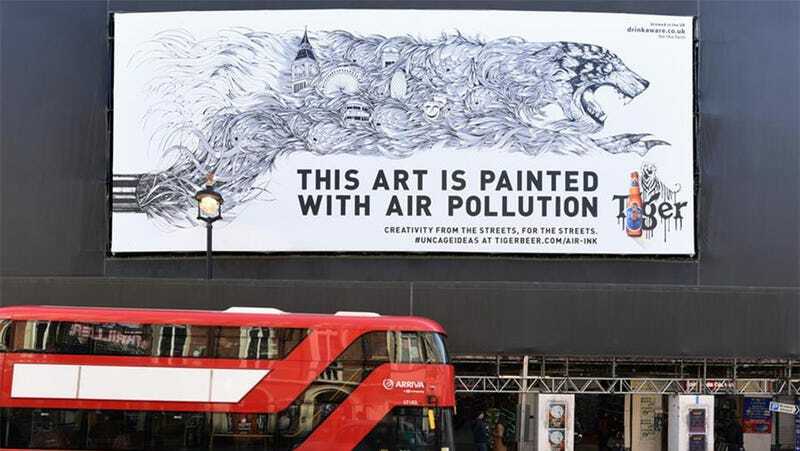 A startup spent the last three years developing markers that convert air pollution into marker ink. Graviky Labs’ AIR-INK markers filter particulate matter, the nasty stuff that comes out of vehicle exhausts—particles so tiny (and dangerous) that they can sneak into a person’s lungs through breathing and cause cancer and other forms of lung damage. The company sold out of the product during its Kickstarter campaign, which raised more than $40,000 for the marker. It’s also partnered with corporate entities like Tiger Beer. The technology is pretty cool: A device (also developed by the lab) attaches to a diesel exhaust to capture the particulate matter. After using gravity-based separation to remove heavy metals and carcinogens from the soot and, then, grinding up what’s left, the pollution turns into a carbon-based pigment. After one last chemical process, ink is born—free of any yucky toxins (though it’s not yet been declared safe for kids younger than 6). Forty-five minutes of exhaust can create a single fluid ounce of ink, enough to fill one of the AIR-INK markers. Founded by MIT graduate Anirudh Sharma, Graviky Labs specifically built the exhaust attachment to capture particulate matter without suffering damage from heat or water. The filter and can catch up to 95 percent of the polluting particles. So far, the technology is responsible for cleaning about 1.6 trillion liters of outdoor air pollution in India, Sharma’s home. There, companies and organizations responsible for powering hospitals, schools, and other buildings through diesel generators buy the filters from Graviky Labs to prop onto their generators. They’re incentivized to do so because the lab buys the pollution back from them. This is a win-win for a country like India: It has some of the worst air pollution in the world. Its capital region of Delhi recently made national headlines after smog enveloped the city, turning it into a so-called “gas chamber,” as Delhi Chief Minister Arvind Kejriwal described it in a tweet. The air pollution is a result of multiple factors, but it becomes severe this time of year due to nearby crop burning by farmers that can’t afford better technology to help prepare for the coming harvest. More than 1,000 artists have received markers. Art wasn’t the original intention. Sharma simply wanted to find a practical use for the collected carbon. The end result? Carbon-laden art that’s ended up on Hong Kong street murals and a London museum.